Good Polish Food is here in Central Florida, thanks to Polonia. I have not been to Poland--yet (on my short list) but all of my ancestors came to the US from Poland between 1886 and 1907, and I know good Polish food when I have it. I had it again at Polonia on a recent evening. I was fortunate to eat at Polonia wiht both my parents, two of my cousins, the husband of one--all from out of town, and a friend of mine on a recent Sunday evening. When we first arrived around 4 or so, the restaurant was not busy, but by the time we left, there were no available tables, a good sign and a testament to the good food. I've eaten here a good half dozen times and never been disappointed. Our dinner party of seven had a variety of tastes and a variety of dietary needs, and overall, we did a great sample of their menu, ordering everything from pierogi to gołubki to blintzes and potato pancakes, not to mention żurek, barszcz, and more. Everyone raved about their meals--none of us were disappointed at all. Our waiter--a young guy with no discernable Polish accent at all--promptly took our drink and appetizer orders, then our dinner orders. He got it all right and had an amazing knowledge of the menu. I was impressed. I can't possibly comment on all the food we had, but I'll mention a few hightlights. My friend Tommy ordered the soup of the day, a hearty Chicken soup. It was indeed excellent. A rich and creamy broth had nice chunks of chicken and vegetable in it as well as what I can only describe as mini-dumplings. The flavor was awesome, some of the best chicken soup I've ever tasted. I don't know if this was authentic Polish food, but I do know that it was very good food. For an entree, Tommy ordered the Chicken Cutlet--a tender piece of chicken breast that had been pounded thin, breaded and fried, and was topped with a garlic butter. It was absolutely delicious, tender and juicy with a nice crisp coating. For go-withs he had the Red Potatoes--sliced thin and pan fried--and the applesauce. This was not traditional applesauce as you may think of it, though. The apples had been grated and so had a lot of texture, not at all overcooked, and served cold. It was very, very good. For her meal, my mother ordered a blintz. Being the great mother she is, she shared a piece with me. The crepe was nicely cooked and the filling was a delicious but not overly sweet cheese filling. There were strawberries to go-with as well, and a bit of sour cream to add to the flavor. This was very good. Someone else in our party had a blintz, too, and loved it. My mother also started dinner with a bowl of żurek, a white soup make with rye sour started and containing some sausage and a boiled egg. I had a taste and have had it before, it is excellent. I'd never heard of żurek until I ate at Polonia, but it is indeed quite a treat. Several in our party had the gołubki and all enjoyed them. I got to sample some a day or two later as leftovers, and I agree, it was very good. A very healthy portion of meat and rice was cooked in a cabbage leaf and topped with a mushroom gravy. Another person had the potato pancakes, also a success story. I started my dinner with a bowl of barszcz--it was excellent as always. Tender beets were grated and served in a delicious broth with a hint of lemon and a bit of dill and a dollop of sour cream. This was an excellent soup. For my main course this time I tried the Chicken Paprikash--boneless pieces of chicken thigh were served in a paprika-laced gravy/sauce atop a bed of kopytki, small potato dumplings. It was marvelous and i not only finished it all, but used my bread to sop up every last drop. Fantastic dinner. We had a great experience here, as I've had time and time before. Polonia is a real gem of a restaurant, very good authentic Polish food. I highly recommend Polonia to you. If you've never had Polish food before, try the sampler, it's divine and will give you a good idea of what good Polish food is like. There's a reason that Polonia has such a high rating on urbanspoon.com--great food! had a very good meal here the other night. The food was excellent though the service was just a bit slow. But, it was a great dining experience overall, and I will be back. I had eaten lunch at Bavarian Restaurant Bar and Grill some time ago, and that was an excellent experience. At that time, I vowed to return, and did so on a recent Saturday night with my parents and my friend Tommy in tow. It was a good choice. We arrived about 7:30 on a Saturday evening to find live music--and accordion player--and a fairly full house. We were promptly greeted, given our choice of tables, seated, and given menus. Our waitress took our drink and appetizer order after we'd had some time to study the menu. As the name indicates, the specialty here is German food. I started with a beer special, a 20 ounce glass of a Weiss beer for a remarkable $3.50. That is a real bargain. We ordered an appetizer, the Sausage Sampler. After receving our drinks, we placed our diner order. And then we waited. There was another large party of about 12 in the dining room and a second party of about 11, and it took a while for our food. Another waiter, perhaps sensing our long wait and that of another table or two, came aroudn and offered bread, which we gladly accepted. It also showed that they noticed and were concerned. The bread was actually very good, a wheat bread with a touch of sweetness, and served warmed. After a while, our Sausage Sampler came out. I chose the Bavarian and Nuremberg sausages. They came grilled and sliced, topped with grilled onions, and accompanied by a mustard-remoulade. These were really delicious, we all liked them. The grilled Bavarian sausages were a bit spicy, the Nuremberg ones a litte more tame. But both were good, especially when paired with the sweetness of the grilled onions and the tartness of the mustard-remoulade. This was a definite hit. And then we waited some more, though we were served more bread and our waitress and the waiter assured us dinner would be arriving soon. I will say this about dinner--it was well worth the wait! Let's start off with what the others had. Dad and Mom elected to share the Pork Shank. Itwas a huge meal. A huge pork shank was slow grilled with some "secret" spices. The fat had all melted away, a testament to a great cooking process. There was a lot of meat and I had a taste--absolutely delicious! For go-withs they had the red cabbage and mashed potatoes and gravy, and also added a side of the spaetzle. This was a huge meal. Though Mom and Dad shared it, they still had a doggy bag to take home as well. For his dinner, Tommy ordered the Wiener Schnitzel with chicken. This was a pounded, flat piece of chicken breast that was breaded and fried. It was delicious as well, nice and crisp, with tender chicken that held up well to this cooking process. For go-withs Tommy had the creamy coleslaw and the mashed potatoes and gravy. The coleslaw was good, nice and creamy but with a good sharp bite as well. One thing to note, both my folks and Tommy had originally requested a baked potato, but shortly after ordering were told that they were out, so switched to the mashed potatoes, which were very good after all. For my dinner I ordered the Rouladen. This was a good choice. It was fantastic, actually. This was sliced beef, rolled and stuffed with sauteed mushroom, pickles and bacon, seasoned wiht mustard and hebs, and then simmered for hours in a homemade gravy. It was soooo good. Now, I will say that the actual sliced beef was a bit dry, but the succulent stuffing made up for all that. I could tastes the onions and the pickle, and got a hint of bacon. It was fantastic. My Red Cabbage was also very good--it was still a bit crisp so did not suffer over cooking. The flavor was spot on. Same for the spaetzle, they were delicious, especially when mixed with some of the gravy. Simply divine. This was a very good meal, one of the best German meals I've had. I would highly recommend Bavarian Restaurant Bar and Grill to all. As good as expected, Red Lobster delivers consistent food and service. Yes, it's a chain, but they certainly know how to do things right and my recent visit there with my folks confirmed that. We went on a week night and, though not packed, there was a decent crowd there. We were promptly seated and our waitress, Kelley, was very attentive and very competent--she provided excellent service. We started with a salad, just a basic salad but good with fresh crisp lettuce on a chilled plate, some tomatoe and onion and cucumbers (not pictured as I gave mine away). The house dressing was very good and the salad was dressed just right. Of course, along the way we also had some of their delicious biscuits--fantastic, though I'm not sure on the healthy or lowfat menus. For their entree, my folks split the Lobster, Snow Crab, and Shrimp Scampi dinner. Served with a baked potato, they both loved their dinner and cleaned it up. For my Mom, this was only the second time she's had lobster, but she loved it. I had the Shrimp Trio for my dinner. About a half dozen of nicely fried butterflied shrimp were served with the usual cocktail sauce. They were very good and well cooked. Next there was the Shrimp Scampi, delicious in its buttery, garlicy sauce. Yumm. Finally there was the Shrimp Alfredo Pasta. Though the alfredo seeemed to overtake the shrimp a bit in this dish, it was still very good. To go with I had the broccoli, always a hit at Red Lobster and my favorite side. With the friendly and attentive service provided, this was a very good meal and we all enjoyed the meal and had a lot of fun. I've eaten here a number of times and will be back. Always good, and one of the better chains. We enjoyed a decent meal at The Smokehouse at Route 46 the other night. The Route 46 complex is actually three different restaurants in what's called an entertainment complex on Route 46 in Sanford, just east of the Seminole Town Center Mall. I have eaten here before and have always had a satisfying experience. The Smokehouse is a laid back, somewhat noisy sort of place with both indoors and outdoor seating. During lunch you order at a counter and they bring your food out to you, but for dinner they've recently converted to "sit down" dining with table service and ordering from your waitperson. The other two eating establishments are "The Saloon"--more of a bar or cocktail lounge atmosphere, and "Monroe's" which is a more expensive, closer to fine dining experience--neither of which I've been to yet. We arrived in "The Smokehouse" to a sign that said, "please seat yourself." Trouble was, there were no free tables. However, the host quickly approached us, took our name, assessed the situation, and said it would be maybe 15-20 minute wait. It was about 10, so not too bad. They did change the sign to "please wait to be seated" and seemed to handle future arrivals quite well. It can be a bit confusing beacuse there are actually two entrances. Nonetheless, they were pretty well organized--for the most part. Our waitress took our drink order. I asked about any ale on tap and was told about their Route 46 Ale which I ordered--twice! It was not too bad, perhaps a bit more sweet and less hoppy than I really like, but it was a good beer nonetheless. I was dining with my folks and a friend, they all had tea or coffee or water. Heck, I wasn't driving! We ordered an appetizer, the Pulled Pork Cocktail. I asked our waitress what it was, and she described it and also said it was one of her favorites. That was good enough for me, we ordered it. It came out rather quickly. Basically it was a layer of their baked beans topped by a layer of pulled pork and topped with coleslaw, served in a crock. It was actually very, very good. We all enjoyed it and all liked it a lot. The creamyness and juicyness of the baked beans combined with the pulled pork were contrasted by the crunch and acid of the coleslaw. I really liked this dish. It was made even better by a bit of the spicy barbecue sauce. We finished this up, lickety-split! 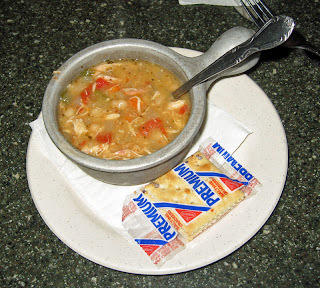 Both my freind, Tommy, and I ordered the soup, the White Bean Chicken Chili. I will say the name is confusing. Is it a soup or a chili? Well, I'd proclaim it a soup because it's thinner than a chili should be. Nonethless, it had a very good flavor. It was not too spicy hot (I could have stood a bit more but I like that kind of heat), but had a rich and hearty flavor. I'd eat this again. And again. And again! In due time our entrees arrived--oops, well, 3/4 of us got served. That was a bit maddening. I believe that all diners should be served at the same time, and that it's the job of both the kitchen and the waitperson to make sure that happens. My Mom ordered the Applewood BLT, a sandwich, but it came out several minutes after the rest of us were served. That should not happen, and especially not with a sandwich--what's to cook? That was a bit disappointing. The waitress did apologize for the delay. Eventually, we all had our food. Tommy ordered the Half Chicken Plate. 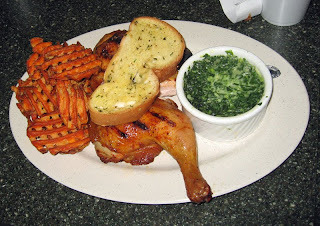 His two sides were Creamed Spinach and Sweet Potato Fries. He liked his sides but did question whether the chicken was fully cooked. I did take a look and believe it was, but it was not falling off the bone cooked. It was tender and juicy, though. He had some leftovers but will cook the chicken a bit more just in case. Mom ordered the Applewood Bacon BLT and really enjoyed it. This was your classic BLT but with a nice, smoky, applewood bacon on it. Thoroughly enjoyable and she ate the whole thing. For a side she had the Creamed Spinach and really liked it. Dad also had the Half Chicken Plate. For sides he had Sweet Potato Fries and Baked Beans. I asked him about the smoke, and he said he really didn't taste much smoke. But overall he enjoyed the meal and has some left for another day. I had the Ribs and Quarter Chicken Plate. 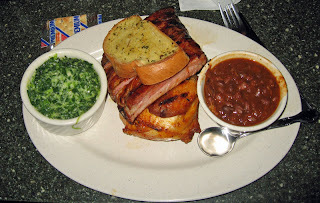 For sides I had Creamed Spinach and Baked Beans. The creamed spinach was outstanding. I liked the fact that it had a bit of crunch yet--not overcooked. It had a very nice flavor. The baked beans were also good, though just a bit on the watery side. Not out-of-the-can watery, but a little less thick than I'd like them. I did not get a lot of smoke from them, either. My ribs consisted of a slab of four ribs. They were not fall-off-the-bone ribs and were done with a dry rub. They were tasty and tender, but I did not get a lot of smoke flavor or smell from them. It left me wondering about the smoke part of smokehouse. My chicken breast was tender and juicy, quite tasty actually. But again, I did not get a lot of smoke. I liked my meal, it was all pretty darned good, but the only thing I found really lacking was smoke, and that seemed a bit odd for a smokehouse. Now Tommy said he got the smoke, so maybe my nose was just not working to well. At any rate, we had a decent meal here for a decent price. It is a bit loud, so be forewarned about that. It's a nice family atmosphere. I think they've done a good job of capturing what I think a 1940s or so smokehouse may have been like. There are other great BBQ place in the Orlando area as well, some nearby such as Kellers, others a bit further away such as Bubbalou's, and some--which I've not been too--that have rave reviews, such as Four River's. But still, The Smokehouse on Route 46 served up an OK meal for a fair price. Taco Polaco or Polaco Tacos are Polish Tacos. The appear to have originated in Texas in the 1970s. You can read more about that here. I first became aware of them via a blog I subscribe to on Twitter, Eastern European Foods. The basic "recipe" I followed is located here. Before attempting to assemble my Polaco Tacos, I did a bit of Internet research. Yes, these are an American invention. So what? It turns out they are very tasty. After reading a lot of recipies, I found that there were endless variations. I decided to go with the recipe i found on Barbara's Eastern Eurpoean Food Blog on about.com. Here's what I did. First, the key was good kiełbasa. To that end I made a special trip to the Polish store in Orlando--Europol Polish Deli. They carry Polish Sausage from Bobak's in Chicago--those people know how to make good kiełbasa! I got the wedding sausage. I took one stick and cut it into about 4 inch lengths, then split each lenghtwise. I grilled each for a good five minutes on a side until slightly browned and some of the fat had rendered out. I put the sausage on a warm flour tortilla--taco size. Then i began the toppings. I gave a generous coating of Kośćiusko Polish brown mustard to the kiełbasa, then added a portion of well caramelized onions. Next was some drained sauerkraut--Polish, of course. Finally, I topped this with cwikla, a mixture of ground beets and horseradish (chrzan, in Polish)--very heavy on the horseradish! I did not put any cheese on these....the chosen ingredients seemed to be enough. I served these to my guests and to a person, they all loved them. I have to say, I was very surprised at the great taste and flavor. The spiciness and fat of the sausage was balanced by the sweetness of the caramelized onions. The mustard and cwikla gave a good spicy sharpness and the sauerkraut added a great texture, a good mouth-feel, to this delight. The tortilla was only the delivery vehicle, attempting to keep all the components somewhat together. In retrospect, I'm sure I'll make these again--but the variations are endless. Refried beans? How about sauteed mushrooms? perhaps topped with potatoes and onion? Who knows, the sky's the limit...my imagination could run wild. These were very, very good. Bardzo Smaczne (good eats!). I have always had a good meal in a casual, relaxed atmosphere at Miller's Orlando Ale House, and my recent visit there was no exception. My parents, friend Tommy, and I went to Miller's for dinner early on a Saturday evening. We were promptly greeted and seated. I loved their tap beer selection--a nice variety, as well as an extensive list of bottle beers. Sometimes, a beer just hits the spot! Our drink order was taken as well as an appetizer, boneless buffalo wings. My salad arrived first, followed a bit later by the wings. The salads were very good and tasty full of fresh lettuce, tomatoes, cucumbers, onion, carrots, cabbage, cheese, croutons...whew, there was a lot there. I sometimes call this a "kitchen sink" salad because it has so much in it. Nonethless, it was fresh and flavorful--and definitely filling. The boneless wings were good as well, 5 pieces of tender chicken tenderloin, breaded and deep fried, and servered in the requested medium hot sauce. Yes, a contradiction in terms, I guess, but I knew those with me would not appreciate a lot of heat. They were very good, the hot sauce adequately hot. Our food arrived in due time, and every one of us was happy with our meals. My mother had the Summer Salad, candied walnuts, craisins, red onions, and blue cheese over a spinach and romaine mix with a raspberry viniagrette dressing. Mom pronounced it "delicious." Dad had the Breast of Chicken Sandwich, a boneless chicken breast chargrilled, and served on a kaiser roll. For go-withs he had mashed potatoes and gravy, and a vegetable. His only complaint was that the chicken was a bit dry, but otherwise the meal was tasty. 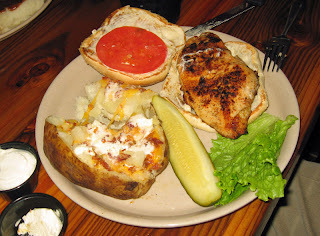 My friend Tommy had a Blackened Chicken Sandwich--a boneless breast of chicken that was blackened and served on a Kaiser roll with a side of a loaded baked potato. His chicken was cooked well and not dry, a good sandwich and a good meal. I had the Cajun Chicken Pasta and it was indeed a good choice. 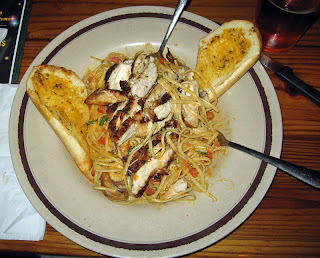 A gender boneless chicken breast, blackened and sliced, was served on a bed of linguine tossed with mushrooms and tomaoes in a spicy alfredo sauce, and served with a few sliced of garlic toast. This was a very good dish. The chicken was cooked perfectly, tender and juicy. And the pasta and sauce had a very nice flavor, just spicy enough without being overpowering. I really liked this dish. Of course, I'd had the large salad to begin with, so was pretty full and could not finish. Well, lucky me, I had a doggy bag to take home and enjoy my meal all over again on another day. The food was good here, as evidenced by the fact that when we were leaving there was a bit of a line and the parking lot was full. 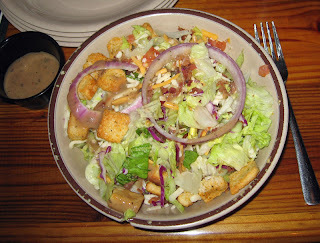 I've always had good meal and a nice dining experience at Miller's Orlando Ale House, and this visit was no exception. I'm glad we went here. I've found another great food blog that links to other food blogs and joined it. The Henderson Epicurean focuses on the restaurant reviews, news and food trends in the Hendersonville, NC area and globally. Independent restaurants are the main focus of this blog, but occasionally, when a local Chain is doing something noteworthy, especially something that will benefit or be of interest to locals, it will be covered there as well. The Henderson Epicurean also maintains a list of other similar food blogs called Restaurant Reviewers, and I am listed there as well. If you'd like to see some of the other blogs they list, scroll through the "Restaurant Reviewers" window in the right hand bar of this window (you may have to scroll down just a bit to find it. And, if you have a food blog and are interested in joining the Restaurant Reviewers Blogroll, click here. Delano on the Park is a very nice place with excellent food and service. I have had lunch at Delano's a number of times and it's always been a very good experience. About a year ago they ventured into the dinner business. My first visit there for dinner was just after they expanded and, though the food was good, there were a few "rough edges" that needed polishing. They've succeeded, grandly! My parents are in town visiting and along with my friend, Tommy, we went there for dinner on a somewhat dreary Friday night. The atmosphere inside was warm and inviting, though a bit loud. There was entertainment which added to the noise level. Basically, everyone in there had to talk loud. It was not painful loud, just a bit on the noisy side. We were promptly seated and our waiter, Dominic, promptly appeared. I had a glass of the house Merlot. It was decent and, at $5, reasonably priced and proportioned. My folks had coffee, my friend Iced Tea. We were hungry and chose to go right for dinner, no appetizer needed. After we ordered, our salads appeared rather promptly. They were very good salads, chopped mixed lettuce with tomatoes, cucumbers, carrots, and a few other things, nicely mixed and not over-dressed. It was a very good salad, very fresh and very tasty. My one complaint is that there was somewhat of a wait for our main dish--the food was a bit slow in coming out. However, Dominic checked up on us frequently and eventually assured us the food was on its way. It was definitely worth the wait! My Mom ordered the Mahi Ceasar Salad. 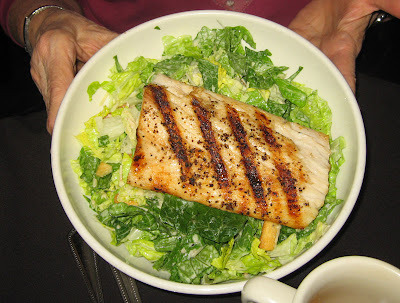 A large bowl of nice and fresh salad, primarily romaine, was topped by a very healthy portion of mahi-mahi. 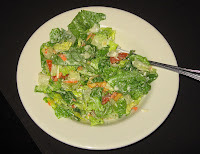 The romaine was poperly dressed with a Roman Ceasar dressing with parmesan cheese and croutons. The fish was perfectly cooked. It was moist and tender and juicy and warm and flaky, not at all dry. I had a bite and indeed, it was so very good. Mom loved it! 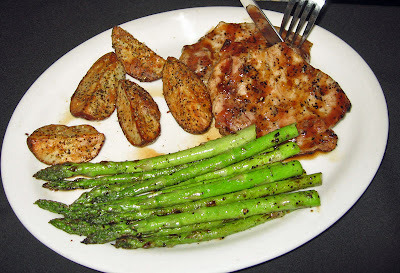 Dad, being more of a meat-and-potatoes guy, had the Root Beer Glazed Pork Chop. This was a chargrilled center cut piece of pork loin, glazed with a slightly sweet glaze containing root beer. It was delicious. The pork was tender and juicy, not at all dry, and exactly what a good pork chop should be. It was accompanied by perfectly cooked asparagus--not at all overcooked, young and tender, and with red roasted potates. It was delicious and Dad manged to finish all his dinner. Very good and very filling. Tommy, for his salad, hesitated. He wanted the Ceasar salad but was hesitant because, of course, Ceasar dressing contains anchovy. Dominic assured him that the anchovy would not be "fishy" in the least. Tommy acquiesced, and after having his salad, agreed that it was indeed very good without any fishiness. For his main course, he had the Blackened Chicken. This was two nice pieces of chicken breast with a nice curst of blackening spices, not overly spicy though, just enough to impart a lot of flavor. The piece that I sample was excellent, a nice flavor, tender and juicy. Tommy reported that one piece of chicken was excellent, but one was just a bit dry. Still, very good. 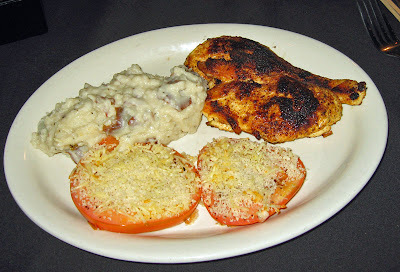 He also had the oven roasted tomatoes on the side as well as Garlic Smashed Potatoes. The potatoes were very good, not overly garlicy, but nice and somewhat creamy and smooth. They had a delicious flavor. For my dinner I chose the Coconut Rum Mahi Mahi. This was an excellent choice. A good-sized portion of mahi-mahi was coated in a panko crust and topped wtih a coconut-rum beurre blanc--It was excellent. The panko crust was nice and crunchy. The fish underneath was perfectly cooked--it was moist and tender and juicy and had a very nice flavor--among the best mahi I have had in a long time, maybe ever! The beurre blanc was also very good and a nice compliment to the fish and crust. The pineapple and coconut gave just a hint of sweetness, not at all overpowering, and the portion of sauce was excellent, not too much, just enough to add the right depth of flavor. I would eat this dish again (too bad my photo did not turn out so well!). I had the steamed broccoli to go with--it was very tender, and, though I generally enjoy broccoli that is less cooked, it was certainly not overcooked. It was very good. I also had the Oven Roasted Tomatoes--though they were good, I thought they suffered from the lack of something. Maybe just a bit more salt? The parmesan/bread crumb crust on top was good, the tomato had a nice fresh flavor and was not overly soggy, is just was missing something to make it pop! Maybe a hint of basil? A hint of lemon juice? I'm not sure. It was good, but not great. Overall, we had an excellent meal here. Delano on the Park is located in "downtown" Lake Mary, across from the city hall. I was pleased to see it busy on a Friday night. It's a nice atmosphere (though was a bit noisy) with good food. They have certainly gotten their act together. Dominic, our waiter, was excellent and remembered everything we ordered and everything we asked for--and never once wrote a thing down. I like that. I konw for sure I'll be back her for lunch again and again, and now I know that I will be back for dinner as well. Our total bill was just under $60 before tax and--of course--generous tip. It was well worth it!